The TPO's also handled registered mail. 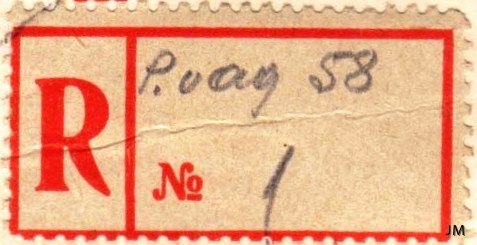 Until printed labels were introduced the appropriate notes were written by hand on the piece of mail. 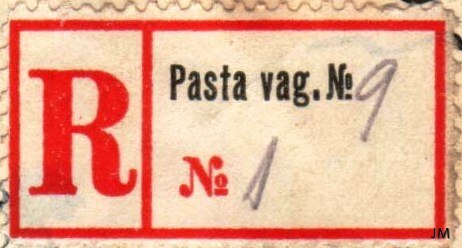 Also rubber-stamps appeared on some routes before different types of printed labels were used. 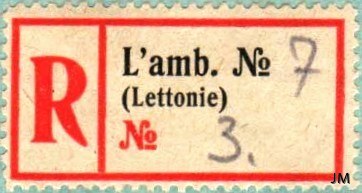 In the printed labels the post office is designated by "L'amb. No.". The "R" and the frame are red but the text in the box is black. 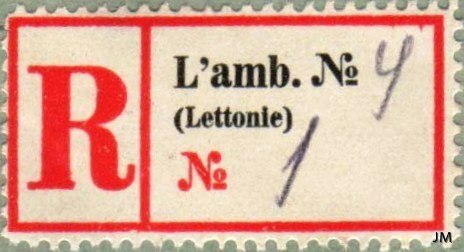 "L'amb." is an abbreviation of the French word "L'ambulance" which in this case means approximately "Travelling" or "Mobile" after which the TPO number was to be entered. On envelopes seen the registration number of the item always is very low, mostly "No.1" or "No.2". Most likely the numbering started from scratch each month. This indicates that very few registered envelopes were handled by the travelling post offices and therefore they have to be seen as very rare. the postal wagon branch No. "42"
No. of the postal wagon, hand-written. 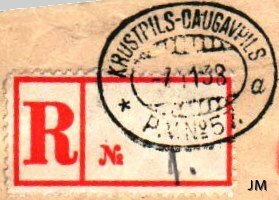 "R" with hook on "leg"
"Studienmanuskripte der Forschungsgemeinschaft Lettland im BDPh e.V., Folge 15 / Latvia: Postage Due Markings Used by Travelling Post Offices by Vesma Grinfelds" is available from the Harry v. Hofmann Verlag in Germany.